Make your jewelry sparkle and bring it to life. 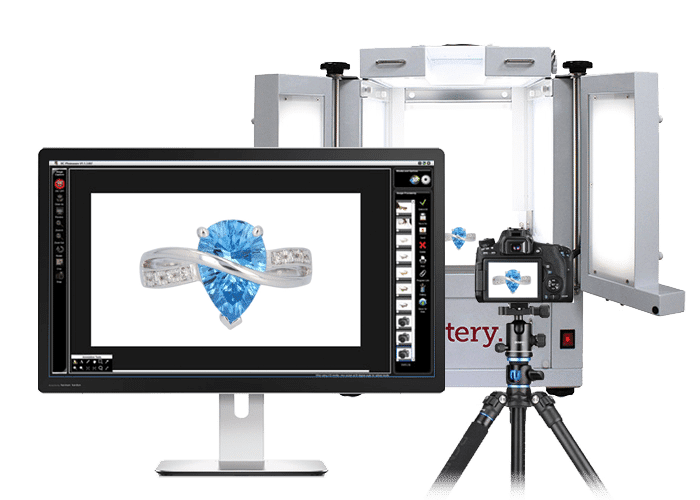 Create professional photos and 360 degree views of fine jewelry for immediate use in eCommerce and print. Each feature of this fine jewelry photography light box with 360 turntable are controlled with Ortery’s photography software. First of all, you can simplify and automate your jewelry photography by memorizing best LED light and camera settings. In addition, it automatically applies and re-uses the best image editing and processing actions to increase photo productivity. Finally, add a 3D Rail (sold separate) and start showing hemispherical and 3D views of your jewelry today. We can teach you how to get the best jewelry photography results. Rotating 360 degree product views of necklaces, rings, bracelets and earrings make your website more attractive and help you sell more jewelry. Consisting of a 16.8 x 16.8 x 23.4” desktop photography studio, system control software, a 7.8” transparent turntable and dimmable LED lamps (top, bottom, front, left and right), the Ortery 3D PhotoBench 80 works in conjunction with a compatible Canon or Nikon dSLR camera to simplify and automate the complete product photography workflow. Simply place an object inside then use the software to compose and take pictures. Quickly create web and print-ready product shots in RAW, JPG, TIFF or PNG format as well as 360 product views in MOV, MP4, HTML5, or GIF. Professional results, no experience necessary. 7.8” Transparent Turntable Holds up to 3 lbs. Camera Settings via Software, then Click Snap. Pictures Immediately Appear on Monitor Screen. Includes TruView 360 for Advanced 360 Stitching with Audio, Hyperlinks, Deep Zoom, Image Tags and more.